I like "A" shirts. Just like someone else. 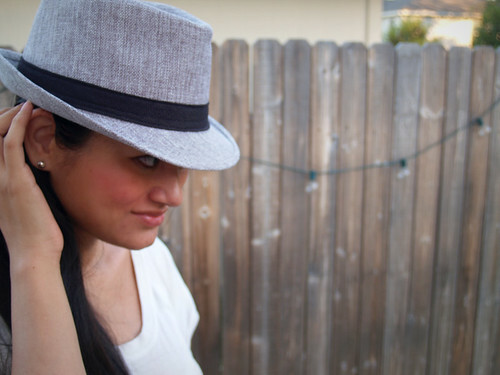 I got this fedora today on an impromptu shopping trip with my buddy Heidi. For the low, low price of $10 I can now rock the fedora. I hope no one thinks this makes me a huge Jason Mraz fan or some madness like that. Oh, and look! I wore flats again! Surprise, surprise. I briefly mentioned yesterday that I was thinking about giving up heels. It's not because I'm a mom, I swear. It's because my feet are a size larger post-pregnancy, and I have to get all new shoes. It seems way more practical to first stock up on shoes that I'll wear all the time. Right now, for me, I'm living in flats, but I do think that when it's date night or I get to dress up for something, absolutely nothing beats a great pair of heels. They're just a little further down on my priority list right now. I'm doing way more laundry than I used to!